Some may consider smoking meats to be a form of art. Others may consider it the only way to barbecue. Each person has their own process and their special selection and different types of wood to give their smoked meats the savory flavors they crave. 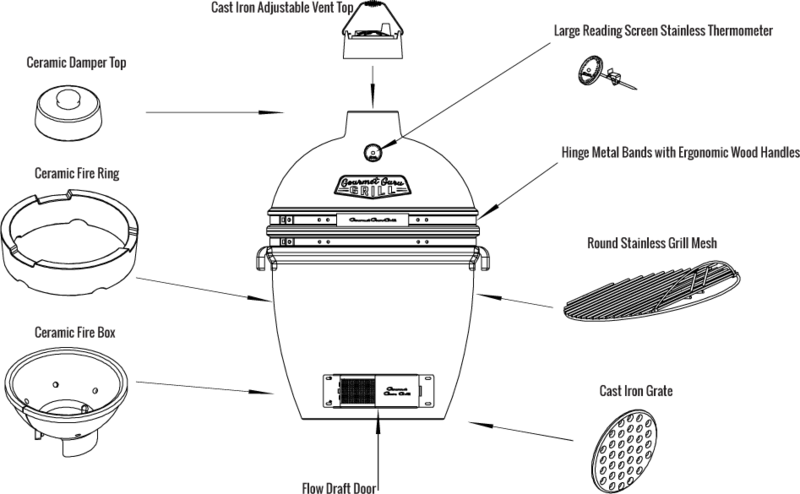 With the Gourmet Guru Grill, you can become a master smoker and create heavenly tastes in the comfort of your backyard. With just a few basic tips and practice, you will be a smoking guru in no time. Like many kamado-style grills, the Gourmet Guru Grill is designed for long, slow cooks. The walls of the ceramic grill are incredibly thick and are perfect for holding in heat, moisture, and flavors. 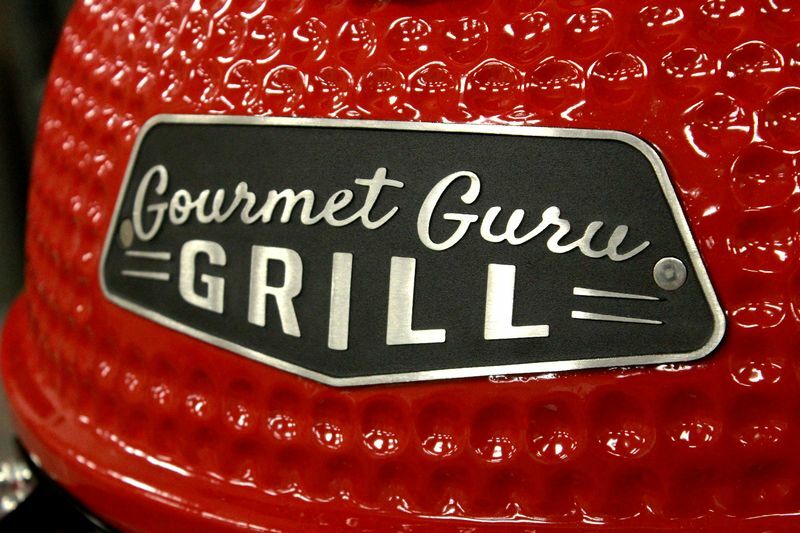 The Gourmet Guru Grill also comes with features such as a cast iron adjustable vent top and a large screen stainless thermometer to make it easy to adjust and read the temperature. The bottom flow draft door also allows you to manipulate the temperature by letting in more air if you need a hotter temperature. When people switch from a gas burning or metal grill to a ceramic Gourmet Guru Grill, the first thing they usually notice is the difference in taste. Some metal grills can give your food a metallic taste especially if they are old or starting to rust. The perk of going with a ceramic grill is the ceramic material itself. With ceramic grills, you don’t have to worry about your foods getting weird flavors or aromas from the grill itself. Instead, food is filled with flavor that you put into it and is infused with the rich aroma of the wood you choose when you decide to smoke. On top of the metallic taste, many metal grills also require the use of accelerant in order to get the fire going. This can also transfer to the taste of your food. The Gourmet Guru Grill uses lump charcoal. Lump charcoal has no additives, burns hotter, is easy to light, and leaves less ash than most other forms of grilling fuel. It also allows your food to taste like food and not a gas can. Build a mound of charcoal and wood instead of just dumping in. Dumping charcoal and wood can prevent air from circulating properly and can keep your grill from getting to the desired temperature. When trying to get your grill to the desired temperature for smoking, it is recommended that you start slow. The reason for this is that it is easier to raise the temperature of your grill, but it can be difficult to lower the temperature since the grill is designed to hold and maintain a certain temperature for long amounts of time. When it comes to creating the best slowly smoked barbecue, you must fail a few times. That’s right. In order to get better and better, you need to hone your skills and learn what works best for you and your grill. Don’t be afraid to change up things. But most of all, don’t give up. 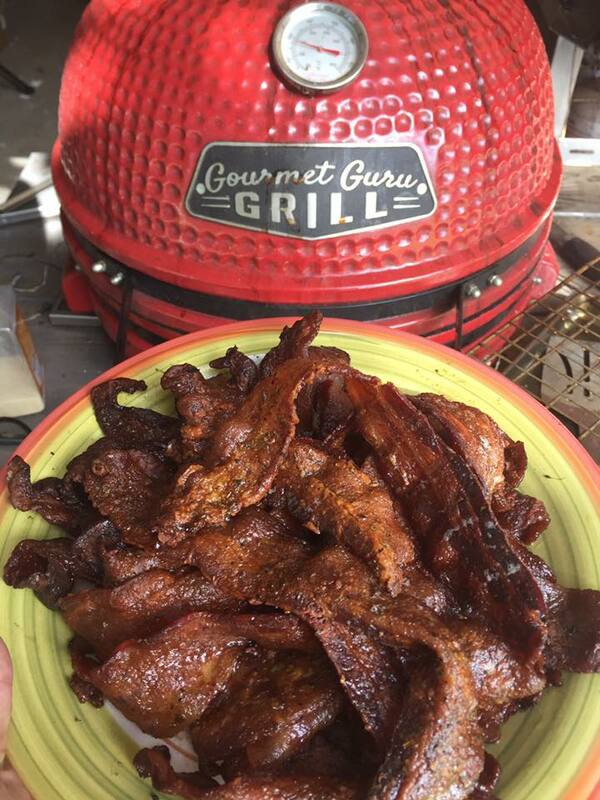 Whether you are new to grilling or you are ready to step up your bar-b-que game, the Gourmet Guru Grill is just what you need. Use the Gourmet Guru Grill to grill, bake, roast, and smoke your favorite dishes with precise temps and with a perfection you just can’t get with a gas grill. Check out the specs of all of our grills, ceramic grill accessories, cabinets and carts, and even find recipes on our website. You can also see the difference yourself by visiting a Gourmet Guru Grill dealer near you. Just click here to go to our DEALER LOCATOR.